First off, I'm not an expert here, nor am I doing something new. I am not the first, nor will I be the last but I still want to share my story. As many of you are away this year I'm in a brand new position with my school district as part of a brand new program. 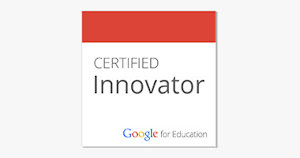 I am the only K-3 teacher for my district's choice program SAIL - Surrey Academy of Innovative Learning. Being a new program means I am building a program as it runs. I will admit there are some challenges because of this but there are a lot more positive adventures. 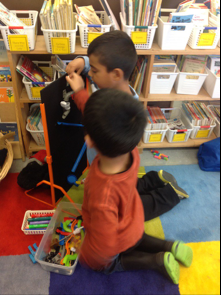 Creating their own problem, then finding their own solution through trial and error. I have incredible students who love to explore, create and design. I've spent a lot of time watching them do this and have been trying to find ways to make our new curriculum fit with their passions, instead of in spite of their passions. So this week we began to explore design challenges. 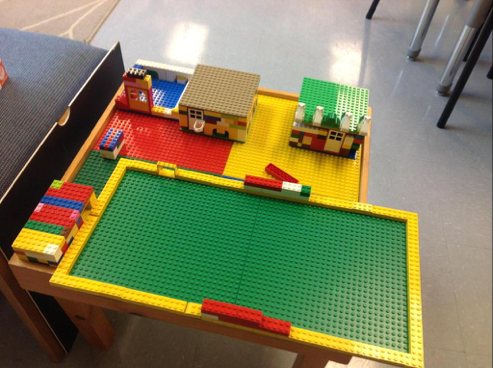 The challenges themselves are quite simple but the beauty of them is that they are using tools my students love to learn with, they were co-created with the students, and the criteria for success was determined by the students. I provided the opportunity for them to learn this way, but they came up with the purpose. Along the way they learned that they have to collaborate to be successful. That sometimes, even with the best laid out plans, that they aren't successful. That mistakes just lead to new learning. That perseverance is a skill, and some of us need to work hard to have some, and for some of us it comes naturally. But above all they learned, once again, that learning is and can be student centered and fun! So what exactly were our challenges this week? The first was "The Contraption Lab"
Inspired by seeing Jake Lee use a product called Weird Wacky Contraption Lab with his grade one students in Hawaii, and how they were working through the design process with it, I knew we needed one too. The goal of the first challenge was to "launch the pig". After some discussion, and actually counting how many pieces the toy had, the students decided that to be successful they needed to use between 5 - 10 pieces. The first group thought they were successful until they counted their pieces and realized they didn't have between 5-10. It was certainly a task in trial an error as the marble was flying of the track, or not landing where they thought it should. As I mentioned it naturally included communication through discussion, problem solving, and a lot of failure. Not every group that has been through this challenge has been successful... yet. Perseverance is key! Working together to design a track that will allow a marble to travel from the top to the bottom and then launch a pig. The second challenge was called Sphero. 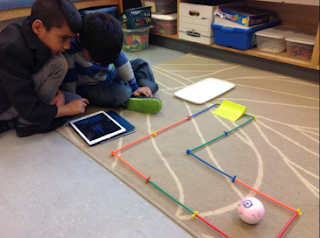 In this challenge we talked about making a maze and using a pretty new (to them ) app called Tickle to program the Sphero through the maze. We decided that as much as it would great to have a complicated maze, the reality was this is still quite a new app so just having a one turn maze would be enough. My students learned a little bit about angles, and speed. Trial and error to program a sphero through the maze. 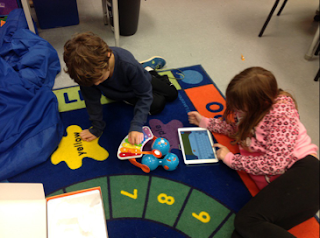 The goal for this challenge was to program the Sphero using the Tickle app. In order to be successful at the challenge the program had to get the Sphero through the maze without hitting the walls. 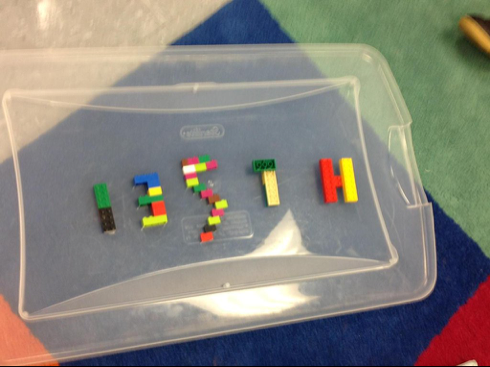 This challenge also required my students to do a lot of trial and error - or as we called it test, modify, and re test. 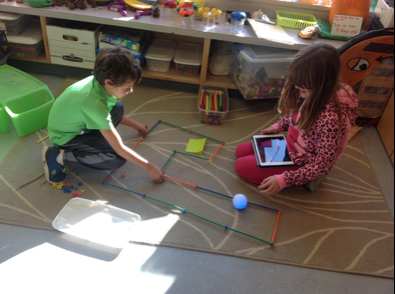 For my younger students the angles and speed variables were a bit too much for them, so we modified the app they used and instead of programming, they guided the Sphero through their maze using the Sphero app. They still had to control the speed, but they had more control when it came to the turn. Design, test, redesign as necessary. Perseverance is key. The third challenge we worked though was the "Dash" challenge. 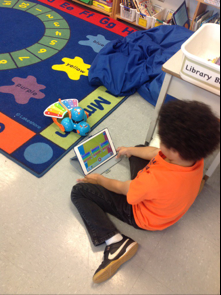 My students have named Dash, Robo Don. The goal of the challenge was to program Robo Don to play Hot Cross Bun and an original tune on the attached xylophone. To be successful their program had to work and play the two songs as required. Hot Cross Bun was chosen because the students were learning how to play it on their tin whistles in music class. This challenge was a bit easier than the others but it sill required the same skills - communcation, collaboration, problem solving, and test, modify, and retest. One group's version of Hot Cross Bun had a note or two out of place, for another group there were long pauses. The students had to figure out how to use the program and then program it to do what they needed it to do. They had to listen to the tunes they were composing, and correct any errors. The sounds, just about right. Time to tweak the tune and try again. Figuring out which notes we want "Robo Don" to play and then programming those notes. Now learning by design challenges haven't been new to my class. Each Thursday morning, before we go to the school library, we have a lego challenge. 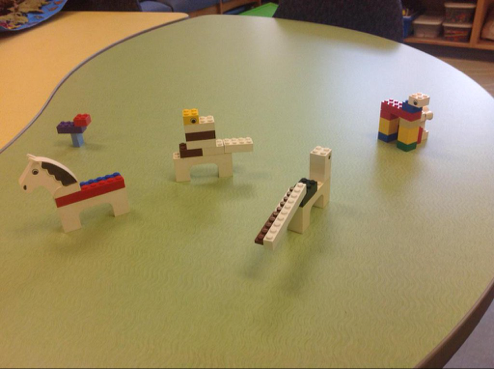 We've written our name in lego, our numbers, made animals, built vehicles, and shelters. This past week our challenge was to make a plant, and some of my students made a full garden including a shed. My students thrive in this challenge based environment. Odd numbers made with Lego. 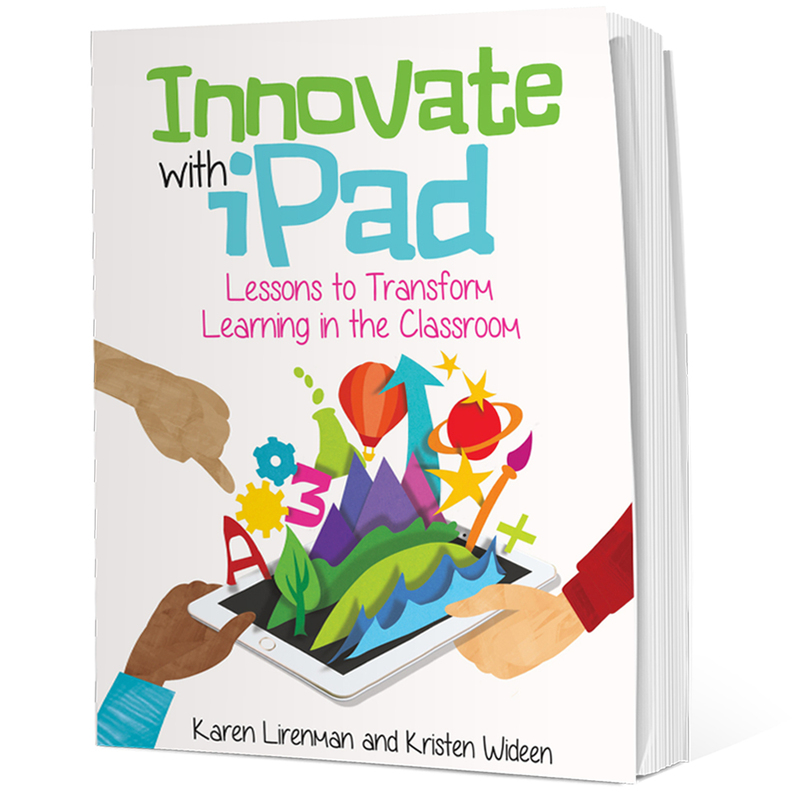 So I'm curious, do you offer design challenges for your students? Are they part of the design process? Please share! I'd love to learn from you. *An update: As my students are only in the building four days a week they have one day a week for home learning. 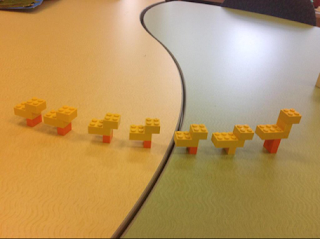 This weekend one of my students went home and designed their own challenge. 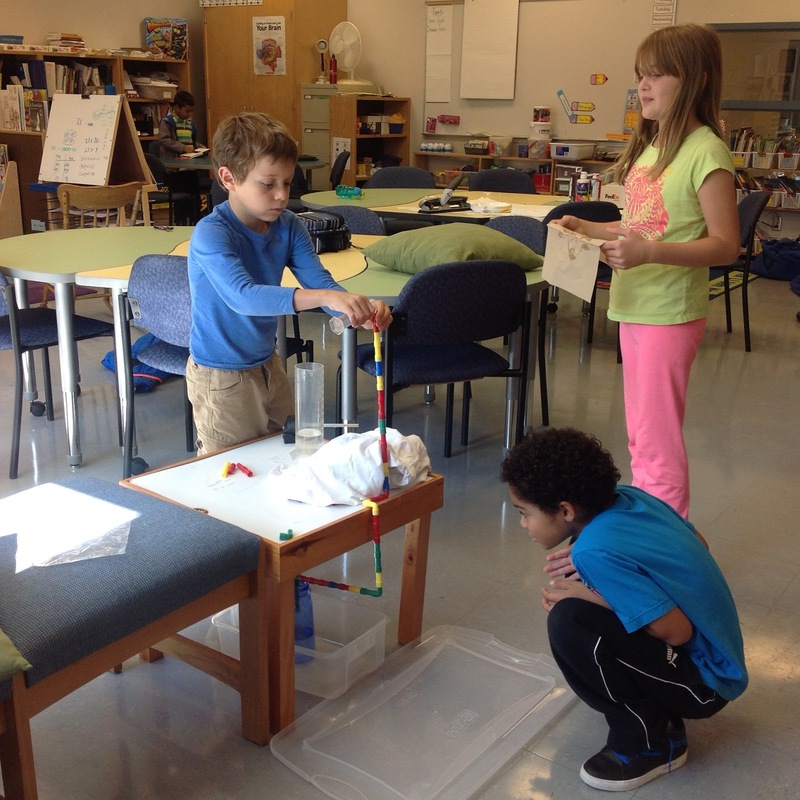 They wanted to create a marble run that went from the top of their staircase, through tubes, and into a box at the bottom of the staircase. They filmed an elaborate video (which I can not share here as it identifies a name with a face) and wrote this accompanying blog post. "My goal was to make a marble run and get it in the bucket. I used tunnels to make it go through them. I messed up on some of them but I got it don. Some of the parts started to move out of place and then the marble didnt go through all the way. On each tunnel I put up I ran a marble to test it and see if it was good where it is. If it was good I taped it in place and did it over and over again. And I finished my goal and got the marble to go in the box. " WOW! Our students are eager learners. We need to continue to find ways to tap into their passions and help them learn in ways that work best for them. I have a huge smile on my face right now as this child not only took what was of interest to her, but involved her family with her learning too. This is a form of teaching and learning I won't be too quick to walk away from anytime soon. Wow, Wonderful images, Its really beautiful.Thanks for your nice post. Great article, Karen. Your new position sounds just perfect for you. I was inspired to try out the Weird Wacky Contraptions. We do design challenges frequently and feel they are an integral and important part of our curriculum. The more we let children explore their interests, solve problems, and learn to reflect on their experiences, the better.